The Carlton Hotel Blanchardstown is one of the finest four-star hotels in Dublin, offering superb conference and meeting facilities, together with stylish dining options to suit everyone’s taste. The hotel is a luxurious contemporary lively hub, with 155 beautifully appointed bedrooms, very popular with ladies' groups where shopping or going to the theatre or races is a must. This hotel is easily connected to many of Dublin’s most popular tourist destinations, which are right on its doorstep. It stands in the heart of Dublin 15. The hotel is conveniently located within a short distance of Ballycoolin, Damastown, and Blanchardstown Corporate Parks 1 and 2, to name a few. A shopper’s haven, it is close to renowned Blanchardstown Shopping Centre and retail parks, Liffey Valley shopping centre, the National Aquatic Centre Waterpark, and Fairyhouse Racecourse is just a short trot away. The hotel is ideally situated close to the M50, M2, and M3 motorways, and just minutes from Dublin Airport, making it easily accessible from all major routes across the country, to both the international and domestic corporate or leisure guest. A short taxi journey from the vibrant Dublin city centre making it a perfect base from which to explore Dublin city. With so many activities to choose from around the city you will be spoilt for choice, with vibrant opportunities including theatre trips, museums, dining out, festivals, concerts, and the energetic nightlife for which Dublin is famous. The hotel prides itself on its devoted and skilled team who work together to constantly deliver an outstanding four star service for which the hotel is known. The hotel is relaxed and friendly, offering everything from convenient location, delightful accommodation, luxurious and spacious bedrooms, and gourmet dining, to free high speed WiFi, ample free parking, and access to the fitness suite. All rooms at the Carlton Hotel are designed to ensure guests are truly relaxed. All rooms are equipped with en suite bathrooms, satellite TV, and WiFi throughout the hotel. Guests return again and again to enjoy the honest hospitality extended to all. A wedding destination with a difference, see the splendid outdoor natural wedding gardens and the magnificent indoor ballroom, catering for weddings and civil ceremonies of all themes and sizes. Evening ceremonies are also a possibility and are popular with many couples. Celebrate in style with the Carlton Hotel Blanchardstown whatever the occasion. Let the team take care of the important events in your life. 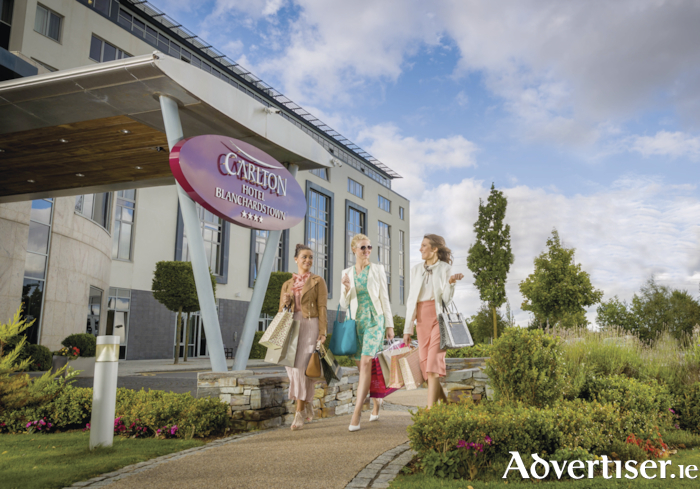 For more information contact the Carlton Hotel Blanchardstown on (01 ) 8275600 or see www.carltonhotel blanchardstown.com.